President Maithripala Sirisena has assured Speaker Karu Jayasuriya to hold separate discussions with the Opposition Leader and the Leaders of the United National Front (UNF) tomorrow evening to arrive at an immediate solution to the political instability, the Media Unit of the Speaker said today. 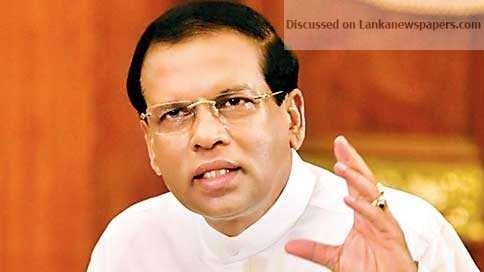 In a statement issued over the brief meeting which was held between Speaker Jayasuriya and the President at the Presidential Secretariat this evening, the Media Unit said the Speaker has brought to the President’s attention the current instability in the country. “The Speaker told the President that all spheres of the country have become unstable today. He said the rapid depreciation of rupee and the collapsing of the investment sector and the tourism sector would be unbearable for the country. Therefore, the Speaker said that immediate solutions should be given to the instability to which the President responded positively. The President also commended the Speaker’s contribution to find solutions,” the statement said. The Speaker met the President following many requests made by party leaders and other factions in Parliament today.